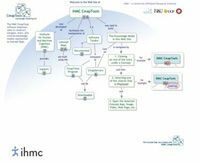 The IHMC Cmap Tools software lets users construct, navigate, share, and criticize knowledge models represented as Concept Maps. These concept maps can be saved in a public space for easy access. Users can edit concept maps collaboratively in real time from remote locations. When collaborating on concept maps, students have the unique ability to respond to each other’s ideas immediately. This means that misconceptions about relationships between concepts can be addressed in real time. In addition, students can build on ideas together, which encourages the acceptance of alternative views. This approach to learning can deepen students’ understanding of the material. Collaborating with Cmap Tools also caters to a diverse group of learners; the intimidation of speaking up in front of the class is erased. It is replaced by a group effort to create a concept map that reflects a little bit of each student. PROS: Cmap Tools has several attributes that make it ideal for use in a classroom. To begin with, it meets the golden rule of education resources; it is currently free to download and use. As a class, you can save your concept maps on a public space. Students can then access these maps at any computer that has a connection to the Internet. They can download the maps at home, personalize the maps, and resave them to their own hard drive, or they can collaboratively work on the map from remote locations at the same time. Changes to the concept maps can be seen in real time, and each correction or addition is stamped with the user ID of the person who made the edit. CONS: If you save your map on the public space, any user of Cmap Tools can open your concept map and look at it. However, they cannot join in the collaborative process or resave the concept map unless you provide them with the password for the account. OVERALL IMPRESSION: Cmap Tools is a comprehensive tool that has a multitude of features. The program is easy to use, and the concept maps are easily accessible from any Internet connection. Overall, Cmap Tools is a great tool to use in the classroom that allows students to connect ideas both on their own and with the input of others.